Written by: DeMarkus Jones – As the last few hours and minutes of 2017 tick away I cannot help but get excited about what 2018 holds for all of us die hard boxing fans. 2017 gave us a lot of good moments. The rise of Terrence Crawford. The dominating run of Vasyl Lomachenko. The fall of Roman Gonazalez. Golovkin vs Alvarez. Mayweather vs Mcgregor. I know there are so many other huge moments that I could name however this article is about the future. With that being said here are five things I am wishing to see in 2018. 1. A challenge for Lomachenko. 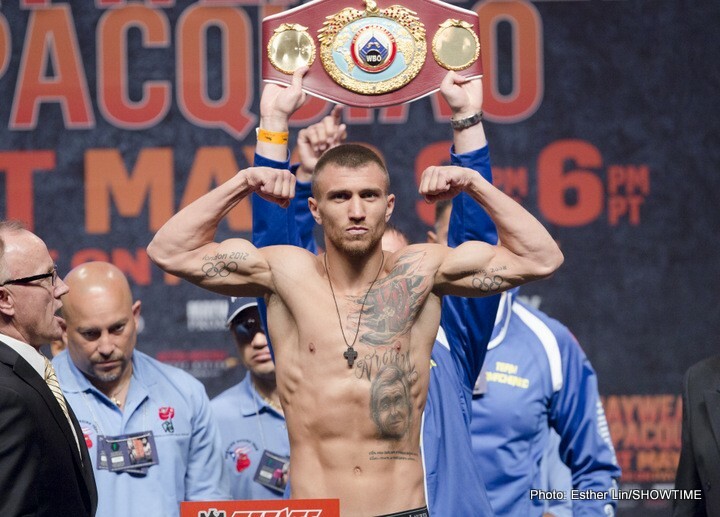 I’ve written about the incredible run that Lomachenko is on before. It is unbelievable. He has never been hurt. Barely even touched. Now as a fan I want to see him pushed. I want to see him in the ring with his equal. Someone who can bring out the best in him. In 2018 I would love to see Lomachenko get taken to his limits and see what he is really made of. 2. An Undisputed Heavyweight Champion. April 29 2000. Was the last time we had one true heavyweight champion. Lennox Lewis unified all four sanctioning bodies and reigned as the best heavyweight in the world. Since that time 26 different men have held the title of heavyweight champion. In an era where the credentials of many champions can be called into question. It would be a dream come true to get these top heavyweight to fight amongst each other and have one king to the top to heavyweight Mountain. 3. No more bad decisions. I know this one is a longshot. Judges are human. Referees are human. All human beings are capable of error. However in a sport that is as cruel and unforgiving as boxing. I know many fans would love to see these errors minimized in fights. Far too often a fighter will go out there and give his all only to have his well deserved victory taken away from him by a blind referee or inept judges. Maybe reeducation is in order. Maybe a change to the system would help. However I would love to see 2018 be a year where only the fighters decide who wins fights. 4. More nationally televised fights. Whether it is one of the big cable networks such as HBO and Showtime. Or one of the broadcast TV channels such as ESPN Spike TV or CBS. The world needs more non Pay-Per-View fights. While I know the pay-per-view model is important. Having regularly televised fights will get more eyes on this Ford and garner more interest in the sport. I am old enough to remember watching Roy Jones jr. On Tuesday night fights on the USA Network when I was a kid. I vividly remember my father talking about watching the greats like Muhammad Ali and Sugar Ray Leonard fight on ABC and CBS. Considering the worldwide reach the sport of boxing has. The more eyes we can get on our sport the better and the more regularly televised fights that occur the more people that will become boxing fans. 5. More shine for the women. In an era where men and women are becoming more equal than ever the female boxer continues to be lost in the shuffle. Most casual sports fans know the name of Ronda Rousey. The UFC and Bellator MMA normally have at least one women’s belt per broadcast. However outside of Claressa Shields there aren’t many prominent female boxers that come to mind. Which is a shame because there are some very talented female boxers. From Cecilia Braekhus to Hanna Gabriel there is no shortage of talent amongst the female ranks. Here’s to hoping in 2018 then women get to strut their stuff a little more. Next boxing news: Who has a better chance of ruling the world again: Amir Khan or Kell Brook?